NETWORK UPDATE: With football adjusted out, THE VOICE and STATE OF AFFAIRS each lost 0.1 in final numbers. That pushed STATE to a new low 1.5, and ominously, it was at 1.3 by its last 15 minutes. Football also resulted in THE GREAT CHRISTMAS LIGHT FIGHT and the CASTLE rerun on ABC losing 0.1 each. Elsewhere, JANE THE VIRGIN shed 0.1. Syfy’s much-ballyhooed miniseries ASCENSION started with a fair 0.61 , putting it in 9th place on Monday cable. The night was led by its usual stars, with ESPN’s MONDAY NIGHT FOOTBALL on top, although it fell a big 1.25 from last week’s game to 3.82. 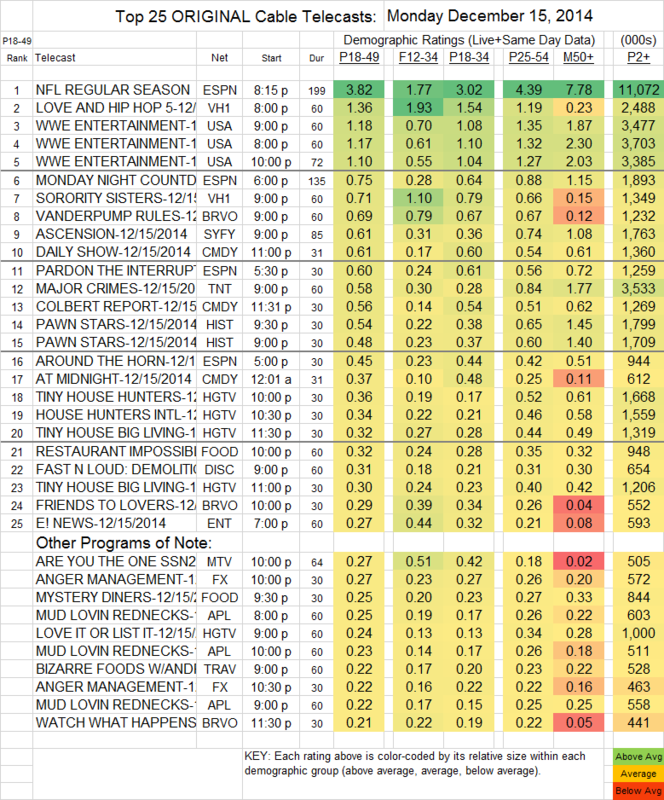 On VH1, LOVE & HIP-HOP HOLLYWOOD lost 0.08 to 1.36, and SORORITY SISTERS was at 0.71. USA’s WWE coverage was in the 1.18-1.10 range, about a tenth below last week. Bravo’s VANDERPUMP RULES gained 0.11 to 0.69, followed by FRIENDS & LOVERS at 0.29. MAJOR CRIMES (TNT) was dead-even at 0.58. PAWN STARS (History) was at 0.54/0.48. THE COLBERT REPORT (Comedy) kicked off its final week at 0.56 (down 0.19 from last Monday, which featured President Obama as the night’s guest), behind THE DAILY SHOW’s 0.61. On Discovery, FAST N LOUD: DEMOLITION was at 0.31. ARE YOU THE ONE (MTV) dropped 0.18 to 0.27. ANGER MANAGEMENT (FX) was at 0.27/0.22, down a few ticks in the 2d half-hour.